Didier Malherbe: Sax to Doudouk! Didier Malherbe, a stalwart of the mythical band GONG talks about his current band the "Hadouk Trio" (that includes Loy Ehrlich and Steve Shehan), his new CD with Eric Löhrer, his poetry and his love for the doudouk. It has been a busy period with two new CDs. Yes, the Hadouk Trio CD “Air Hadouk” came out last year and “Nuit D’Ombrelle” that I did with with Eric Löhrer this year. What is the history of the Hadouk Trio? The band was originally started with just me and Loy Ehrlich who I met back in the 70s when we were living in the Gong commune. He then became interested in African music, working with Youssou N’Dour and Toure Kunda and he started to play the hajouj (African bass). We met again about 15 years ago and decided to join forces. In fact the word Hadouk comes from two words: “Hajouj”, African bass, and Doudouk, the Armenian oboe, our respective instruments. We then realised that there was another group called Taraf de Haidouk from Romania but we are something completely different. On the third album we invited Steve Shehan, the drummer and percussionist, to join us on one song and it was so good that we decided to make ourselves a trio with Steve who is now based in France. We started playing a lot, touring in France and abroad. This is an album I recorded with the jazz guitarist Eric Löhrer. I particularly wanted to add a guitar as that was the sound I was looking for so I started working with Eric who is a very good jazz guitarist. He had previously made a CD of Thelonious Monk covers as well as a few solo albums, including one called “Evidence” which is the name of a song by Thelonious Monk. The idea was to reproduce what we actually do on stage – which is to combine improvisation with some older jazz standards. We often give little surprises when we are on stage by playing something quite well known and then following it with some improvisation but we thought this would be too much zig-zagging between styles, which might be tiring for the listener. For that reason we have one CD of standards and one CD for the improvisation. Yes. The St James Infirmary ballad is mixed up with an 18th century Armenian tune. It is called Eshkhemet. The strange thing is that these two songs start the same way so we made this into a hybrid tune. What instruments are you playing at the moment? I have been putting all of my energy into playing the doudouk for the last 15 years. I have pretty much dropped playing the soprano saxophone and am concentrating on what is basically pioneering work in the field of the doudouk. The doudouk is a very old instrument and there are a lot of truly great players around playing Armenian music with the doudouk, which has a great emotional range. Are you one of the few people playing the doudouk outside of Armenia? I am probably the only musician playing jazz with the doudouk. There are plenty of excellent musicians all over the world but nobody doing quite what I do with jazz. Usually musicians maintain the Armenian style but nobody has been expanding the sound into jazz. I started playing the bamboo flute when I was 20 years old. This is an Indian flute with 6 holes and no keys so you play a semi-tone by opening half the hole. It requires a lot of discipline to become proficient. When I started playing the doudouk I used my Indian bamboo flute technique of opening the holes to my doudouk playing. So that way I could play chromatic scales. I knew some jazz tunes that I used to play on the saxophone years before and I had the idea to play the jazz ballads on the doudouk, so that is how it all happened. Are you planning to tour to promote your two new CDs? We will be in England in September but no plans for anything else except maybe India. We may be doing a tour of the Alliance Francaise cultural centres. Last year we toured Africa, in Mauritania, Senegal Mali, Burkina Faso, Togo and the Congo and we enjoyed that – we like to play abroad, so we hope to do more but we are still not so well known outside of France. Do promoters have trouble considering your music “pure” jazz? We are not considered pure jazz at all. We have carved out a niche for ourselves and we have a lot of people who like us but we have a very specific sound. Not all traditional jazz fans like our music. But having said that that we did win the “Band of the year” at the Victoires du Jazz 2007. We are halfway between jazz and world music so promoters have a problem as they don’t know how to book us and they also prefer to push bands with singers on to the World Music circuit. We also like to select our gigs, we like to play good ones, nothing too small. D.MALHERBE – E.LÖHRER St James Infirmary from Didier Malherbe on Vimeo. Have you thought of adding a singer and becoming a quartet? We have invited singers in the past. For Baldamore we invited Malouma, the Mauritania singer and then we invited Daniel Waro from the Reunion Islands and on Shamanimal we invited Wasis Diop. But having a full time singer in a band changes the nature of the group, it becomes very different. You have also worked with John Hassel, the American trumpeter. Yes, John Hassel, he is a very well respected musician. We involved him on our Utopies album, in fact we sent him an MP3 clip of the recording over to New York and he sent his solo version back the same way! All very simple! It was excellent, we loved the final version of the tune. I was with them in the 70s and then nothing in the 80s but in the 90s I went on a couple of tours with them. We went to Japan and the USA but in 2000 I stopped completely although I have done a few recordings with them since then. Yes, I stayed quite a long time. People were coming and going, but I was there from 1969 to 1979 more or less. I have good memories from that period. So you branched out on your own in about 1980? Yes, I started a band called Faton Bloom, this was still jazz rock. I had not started playing the doudouk yet. I formed the band with François Cahen who was the keyboard player from Magma. I know you write poetry as well. Yes, I do a solo act which I named after the title of my book, L’Anche des Metamorphoses, these are poems I wrote to pay homage to reed instruments. There are 128 sonnets and in the solo act I read a selection of them, then play a bit of music, then read a few more poems. I wanted to ask you about some of the instruments you play. 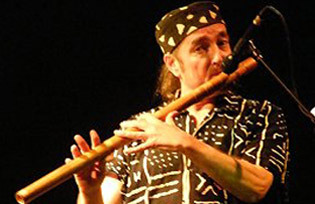 The Doudouk, is an Armenian oboe. It is difficult to classify as the oboe, like the bassoon, is a double reed instrument. When you have a double reed it means that you have two little reeds that are joined together. The doudouk reed is just a tube that has been filed so it is not exactly an oboe. Because of the filing it can resemble a double reed though. The sound of the doudouk is a bit bassy for such a small instrument. But for this reason the doudouk has a huge expressive range which is why I like it so much. The ocarina is a globular flute made of clay and it exists all over the world, there are some very old Chinese and pre-Colombian ocarinas and African ones too. The name comes from the Italian and it means “little goose” as it resembles the beak of a goose. The Khen is from Laos. It has 16 long tubes and inside the tubes each one has a tiny metallic reed a bit like a harmonica. Each tube has a little hole and when you cover the hole the air passes into the reed and you can play chords. I just love playing it. Are there any reed instruments you are still waiting to try? Not really but only because you cannot play them all. I have to restrict the number of instruments I play as each one has to be worked on and you have to practice to become an expert. It is not easy, it takes time. I have been playing the doudouk for 15 years now and I still play a few hours every day. You can’t really play an instrument occasionally. There are plenty of interesting reed instruments in China and Turkey but I can’t do everything! I really feel that the instrument with the best sound is the doudouk so I am sticking with that. Who got you started in music, did you come from a musical family? Not at all. I started when I was 14 playing the saxophone because my brother and me bought some jazz records and wanted to start playing. At the time I was listening to Charlie Parker records and that got me started, and I never stopped. You also studied at the Sorbonne. Yes, I studied literature and I was writing poetry but that was back in 1968 but I had to decide to become a writer or a musician and I chose to become a musician. How is the French jazz scene now? Very vibrant. Originally we always did everything by ear with no scores but now jazz musicians are very well trained. Jazz is very difficult music, you have to be a bit of a scientist but the younger jazz musicians are playing at a very advanced level. Things have changed. There are some very good trumpet and saxophone players in France. Hopefully India! We are trying to organise the tour at the moment, then maybe another Hadouk Trio CD at a later stage but it is still early days.